Acnes are never welcome regardless of where they appear on the skin. Its, however, terrible when they emerge on the forehead since the strategic location allows every individual to notice them immediately they meet you. If you are tired of drawing this kind of attention when you’re mingling with people, then you need to adopt an ideal method that will eradicate the most stubborn acne. You shouldn’t worry about how to get the crucial information on forehead acne since this article will filter through the available acne-eradication tactics to give you the safest yet reliable treatment courses. Read on to get more! 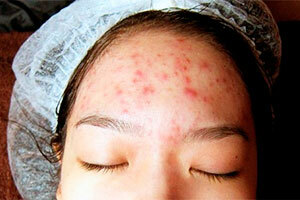 The acne appear on the forehead as red bumps known as papules which may collect pus at the top to form pustules. They can start as small bumps that are unnoticeable but progress into a bad acne breakout if you fail to adequately eliminate them. Just like any other type of acne, these pimples develop as a result of an accumulation of sebum on your skin. The oily substance, when produced in excess, forms a layer on the skin which combines with dirt resulting to clogging of the skin pores. Consequently, a conducive environment for the multiplication of bacteria under the skin is created leading to an infection which presents as cystic acne with pus. The pimples’ location make them easily identifiable thus making them the worst form of acne for many people. The emergence of forehead acne is a phenomenon that affects people across all age groups. Are you wondering how to clear the pimples? While they are unattractive, you don’t need to lock yourself in your house! There are numerous methods you can apply to eradicate these stubborn acne. However, you should ensure that you avoid all the factors that can lead to overproduction of sebum including stress, unsolicited use of makeups, and scrubbing your face too hard. All acne are caused by the clogging of the skin pores due to various substances including sebum oil, dirt, grime, and any other impurities that interact with your skin directly. While you don’t need to prevent the production of sebum, it’s necessary to ensure that the oil is produced in the right quantities. This will minimize the chances of the dirt and grime to solidify and clog the skin pores which would otherwise lead to the emergence of acne. Stress. You’re likely to give birth to forehead pimples if you are experiencing stressful situations in life. The condition upsets your hormonal balance leading to overproduction of sebum and clogging of the skin pores. If you don’t apply swift intervention measures, it is likely that you’ll suffer from acne. Even worse, the bacterial infection may deteriorate leading to cystic pimples with lots of pus. You should never prick these pimples since it will lead to ugly scars on your forehead! Some Medications. Have you experienced acne after you started taking certain medicines? While it’s not obvious that the medication is the direct cause of your problem, there is a significant chance that they are contributing to the development of the acne. 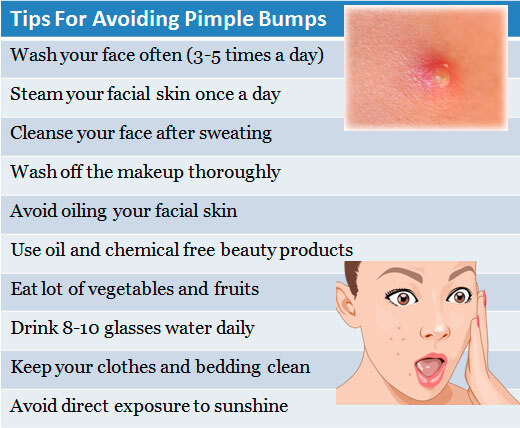 Some medicines such as birth control pills affect the hormonal balance leading to the development of pimples. You should always consult your doctor when you realize a surge in the concentration of the forehead acne while taking medicine. Poor Dietary Habits. You should stick to a healthy diet to prevent digestive problems which are directly linked to forehead acne. Eat lots of vitamin-rich fruits as well as food rich in fiber to prevent constipation. You should also make sure that you drink plenty of water to maintain the smooth texture of your skin! Failure to Clean your Face. As you may be aware, oil is highly sticky and once over released on the skin surface it remains there for quite a long time. Its stickiness allows trapping dirt and dust which accelerates the clogging of the pores. As such, you should clean your face twice daily with plenty water. Other factors include dandruff and genetic factors. 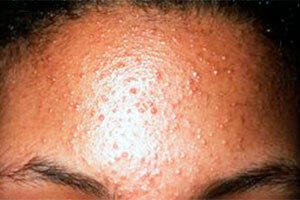 In some instances, you may notice that there are numerous bumps that form groups of pimples on the forehead. Unlike a single acne, the subclinical pimples appear as conspicuous bumps that almost every individual you meet will easily identify. Hormonal Changes. As children enter the puberty stage, there is an upsurge of hormonal activities in the body. This increase leads to a rise in the activity of sebaceous glands leading to overproduction of oil. The phenomenon would also affect you if you’re elderly or a woman experiencing pregnancy, periods, or post-menopausal symptoms. The oil leads to blockage of numerous pores on the forehead leading to the birth of numerous clusters of pimples on the forehead. Environmental Factors. Changes in the environment have the potential to lead to subclinical acne especially if you have a highly sensitive skin. The commonest environmental factors that may result in acne include changes in temperature, acidity levels, humidity, and sunlight levels. Also, environmental pollution leads to the emission of dust and harmful chemicals that may accelerate the emergence of acne. Wrong Cosmetics. When you choose the wrong cosmetics, you can be sure that it’ll have adverse effects on your skin. Some lotions, gels, and creams that you apply on the face may lead to irritation, allergies, and consequently acne. As such, you should always be extremely cautious with the product you use on your face. If you need to change your routine beauty cosmetics, it’s necessary to check the active ingredients of the product and investigate their side effects. If in doubt, you shouldn’t hesitate to consult your dermatologist. You should always ensure that you know the type of your skin since it determines the ideal cosmetic product for use on your face. Nevertheless, you should avoid products that are too oily, thick, and creamy to prevent their accumulation on the skin which can lead to acne. Also, keep the face moisturized and drink lots of water to keep it healthy all the time! While acne treatment can be frustrating and energy-draining, there are proven methods that you can apply to eliminate the forehead acne fast. The treatment starts by reversing the causative factors and ensuring that you terminate their use. If cosmetics are to blame for the emergence of the acne, you should cease using that specific product. Also, you can adopt an acne diet to help in restoring vital constituents necessary for recuperation including collagen, vitamins, and fluids. Once you’ve achieved this crucial stage, you need to try natural methods of acne elimination before embarking on dermatologist acne treatment options. These methods have a natural way of fighting the acne-causing bacteria as well as astringent properties to ensure that no scars are left behind after the completion of the treatment process. To read on the ideal products that you can use in the acne treatment, you should visit natural acne treatment. As a last resort, you can use either topical or oral antibiotics to treat the acne. You should, however, apply this method after a thorough consultation with your dermatologist to avoid later complications which may deface your forehead! While there are numerous methods of eliminating acne, the best one is dermatological acne medication option. This approach ensures that you don’t treat the acne blindly but rather investigate to find out their genesis. As such, you are able to resolve the current situation as well as prevent future occurrence of the forehead acne. The dermatologist will prescribe certain antibiotics that you should religiously take to eliminate the bacteria causing the infection. Some of the most commonly applied antibiotics include the clindamycin and erythromycin. Depending on the severity of your condition, the doctor will recommend the convenient dosage as well as the mode of application; whether oral pills or topical creams, gels, or lotions. You may be wondering why we recommend the dermatological option as opposed to the natural method which is considered safe by the majority. Right? Well, the natural methods are ideal and have worked well in the past. However, there are instances where some people are allergic or react negatively to certain natural constituents. Considering the strategic location of the forehead, we do not recommend that you take a gamble with the natural methods to eliminate the acne lest they backfire! You should, therefore, visit your dermatologists for an analytical review to determine the best elimination technique. You can successfully remove forehead acne using natural methods that you can easily obtain at home. Clay Mask with Lavender Oil. You can prepare clay mask using either lavender oil or tea tree oil. Gently mix clay powder with the oil and rose water until you achieve a uniform paste. This method ensures a supple skin within just a day! The powder absorbs excess sebum while the natural essential oils provide astringent value to eliminate the forehead acne and ensure a blemish-free face. Apple Cider Vinegar. You can also use this product twice a day to restore your demeanor and self-esteem as you interact with people. You just need to apply it directly on the forehead using a fresh cotton wool. It helps in the maintenance of acidity balance and is ideal for all skin types. Also, the product has superb astringent and antibacterial properties for an evener skin tone. Please see detailed descriptions here. Lemon Juice. This product is rich in vitamins which are critical in ensuring a smooth, acne-free forehead. You should apply it every night before going to bed and wash it off in the morning using plenty of water. The juice unclogs your skin pores and has astringent properties that control the production of sebum. When using lemon juice, avoid direct contact with the sun as the skin becomes photosensitive. Other natural products include green tea, Aloe Vera, mustard powder with honey, glycolic acid, and tomato mask. The most effective acne prevention measure is avoiding all the causative by ensuring that you regularly clean your face using friendly soaps. Also, exfoliate your forehead to open up the skin pores but ensure that you do not apply too much force to the skin. You should also minimize the frequency of scrubbing your face. Avoid over exfoliating your skin as it worsens the acne! You should ensure healthy diet by frequently drinking water, eating a balanced diet, and taking plenty of fruits. Additionally, ensure that your meals contain sufficient roughage to enhance digestion which further boosts the health of your skin. Finally, you should always treat scalp acne as well as the chest acne since they may spread to the forehead if you fail to employ all the necessary eradication mechanisms. Read how to prevent acne for more information. Dehydration Complicates your Acne Battle! As earlier indicated, the oil content on your skin contributes significantly to the emergence of forehead acne. When you’re dehydrated, your skin becomes too oily which facilitates the trapping of dirt and dust which later clog the skin pores! As such, if you need to quicken the healing process, you’ll need to take plenty of fluids to keep hydrated. Too much sunlight is harmful to your skin! While morning sunlight is helpful for the maintenance of your skin’s integrity, you need to limit the duration of exposure. You can achieve this by either staying under a shade or applying sunscreen if you have an outdoor job. Hair products can cause forehead acne! Always ensure that you avoid direct contact of your hair cosmetics with the skin. If not, the periphery of the scalp and the forehead will suffer the brunt of the harmful cosmetics! Not all acne are caused by hormones. Like discussed herein, there are myriad factors contributing to acne. The misconception that all pimples are hormonal-based is untrue. All factors that lead to blockage of skin pores can lead to acne! Dairy worsens your acne! Dairy products have been shown to have adverse effects on the health of your skin. They are particularly associated with worsening of acne. The milk proteins and not dairy fats are particularly the reason that such products derail the healing process. As such, reducing the dairy fat ration may not resolve your acne problems. There is nothing as disappointing as an acne that emerges in the most conspicuous area of your body. Well, forehead acne can take away your self-love and reduce your confidence while facing people. You, however, shouldn’t worry since there exists an ideal solution to resolve all your problems! You should ensure that you read through all the options that we’ve recommended to allow you identify the best. Note that human skins are different and it is untrue that a product will work on your face simply because it worked on someone else’s skin! As such, evaluate your skin’s needs and adopt the most convenient product for you. Apply it using the instructions herein and wait for the transformation of your forehead!